Harriet Pecot, Caminar’s Director of Development, with over 100 warm coats donated by Laurel Elementary School in San Mateo. Look at all these warm coats! 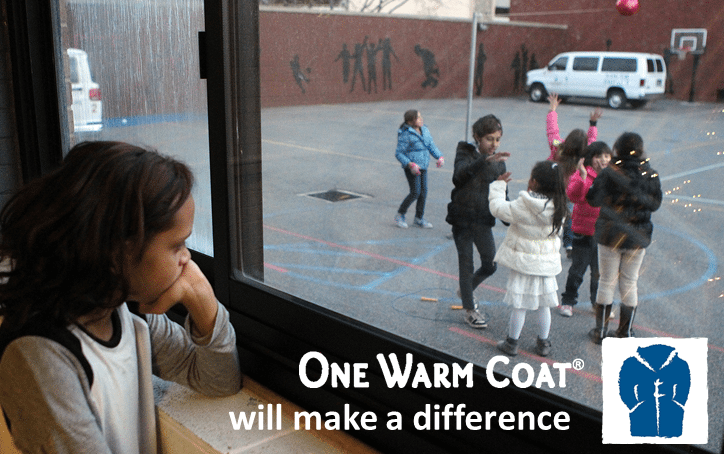 We are delighted to be the recipient of Laurel Elementary School’s One Warm Coat Drive, held in October. 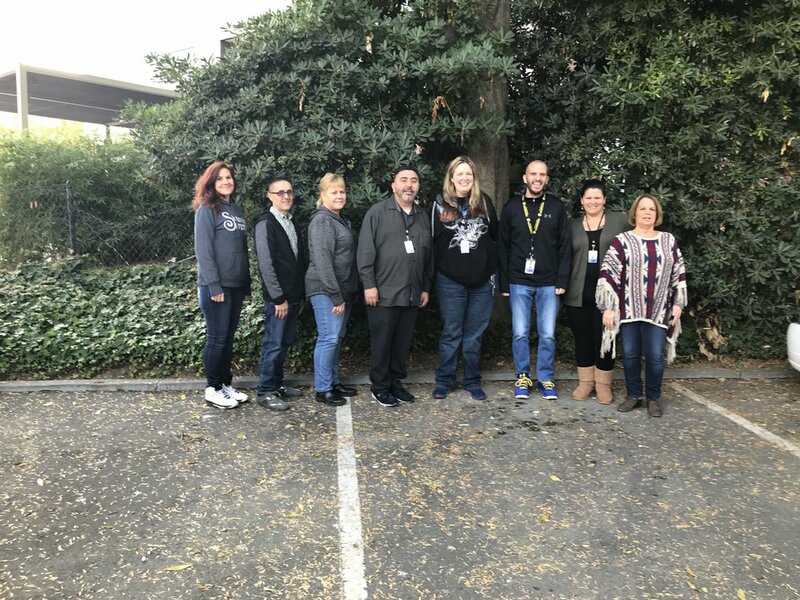 Laurel Elementary, a school located just around the corner from our San Mateo Headquarters, collected over 100 warm coats for children and adults and donated them to Caminar clients. 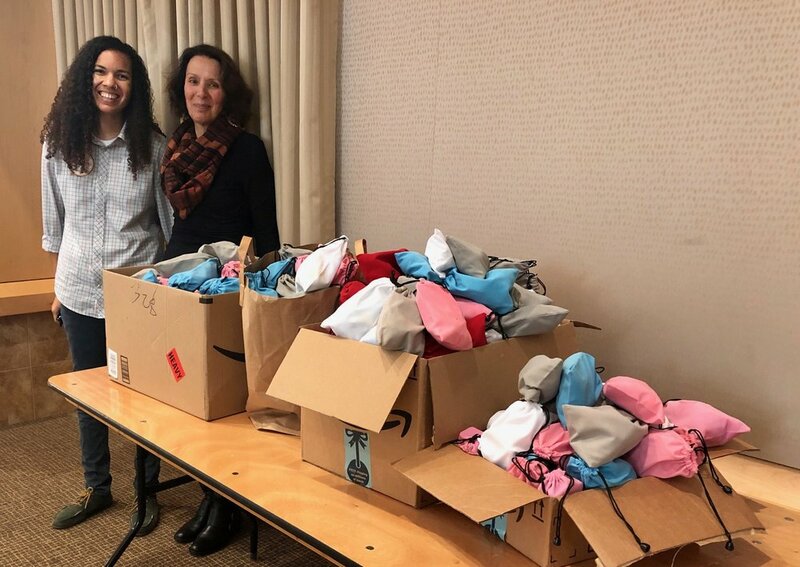 We delighted in sharing these gifts, which have been distributed to vulnerable members of our community and will help to keep them warm and healthy this winter. 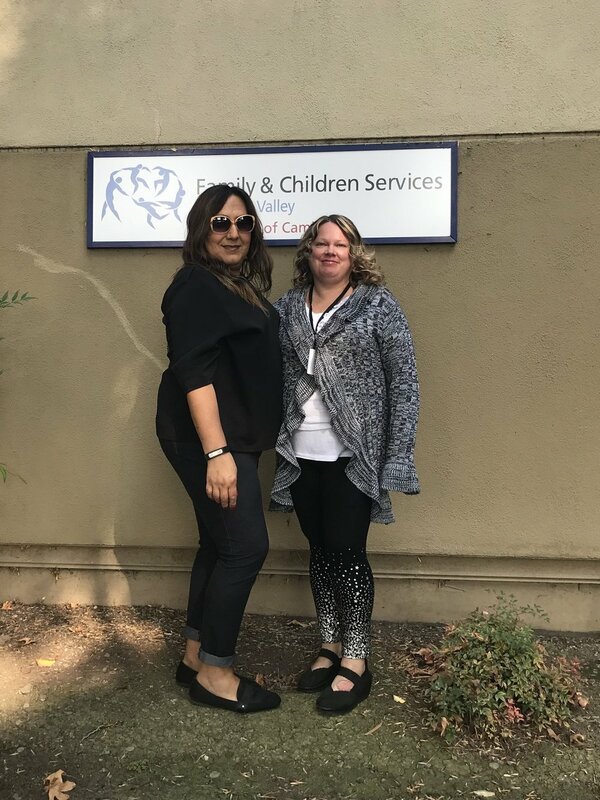 Since many of the coats were for youth, we loved giving them to young clients in our Santa Clara Region, especially those who participate in our LGBTQ Youth Space, our Positive Solutions Program for family violence and abuse prevention, and our Substance Use Disorders Services. We are so grateful to the students, parents, and staff members of Laurel Elementary who generously donated new and gently used coats; Thank you! Caminar Jobs Plus is thrilled to partner with Microsoft for no-cost computer training for our Jobs Plus clients in San Francisco! This tremendous opportunity will allow our clients to gain invaluable skills—and confidence—to help them find and maintain competitive employment. The partnership will soon expand southward and offer the same services to clients through Microsoft’s Palo Alto and Santa Clara stores. We are grateful to Microsoft for their generous support of our clients as they move toward resilience, wellness, and independence. We’re proud to share these updates from our LGBTQ Wellness team! From July 2017 to June 2018, LGBTQ Wellness’ programs and services reached 1,255 members of our community. We share these numbers with gratitude to everyone who took part in programming over the year! Click here to get up to speed on the LGBTQ Wellness program’s offerings, including the relaunched Speakers Bureau and new OUT TO social gatherings. 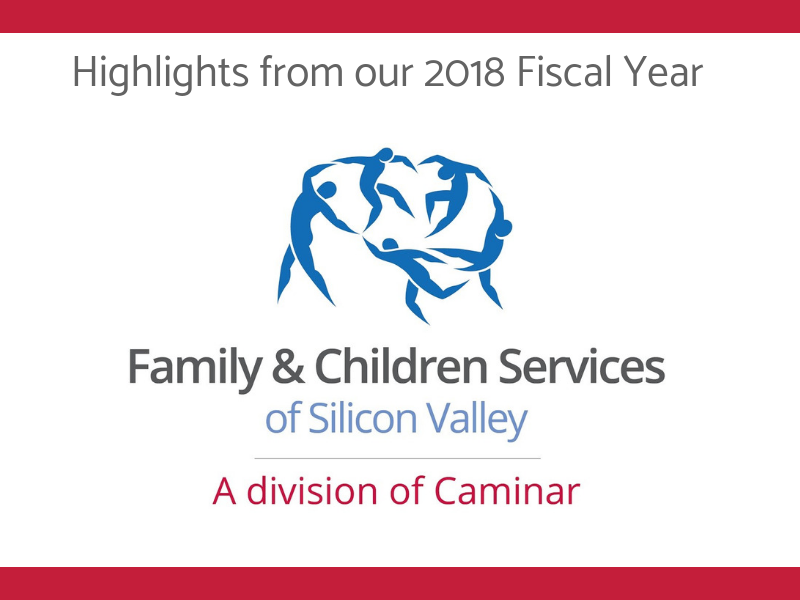 We are delighted to share a few highlights of what our donors helped to make possible for our Family & Children Services of Silicon Valley division over the last fiscal year. While this list could be quite lengthy, we have selected just a few examples that illustrate ways that, together,we are building on FCS’s 70-year tradition as a trusted, pioneering community resource. 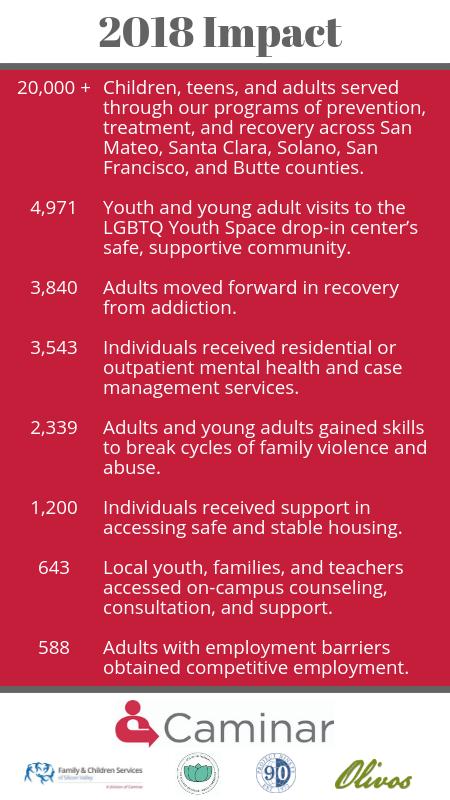 Across all our programs, we reached more than 19,000 people in fiscal year 2018 (7/1/17 to 6/30/18)—11% more than in the prior year. And that doesn’t include most family members of our clients and entire school communities influenced by the consistent presence of our highly-skilled on-campus therapists. Over the last year, we expanded our Substance Use Treatment Services, becoming the first provider in the Santa Clara County to offer the full ASAM continuum of outpatient services. 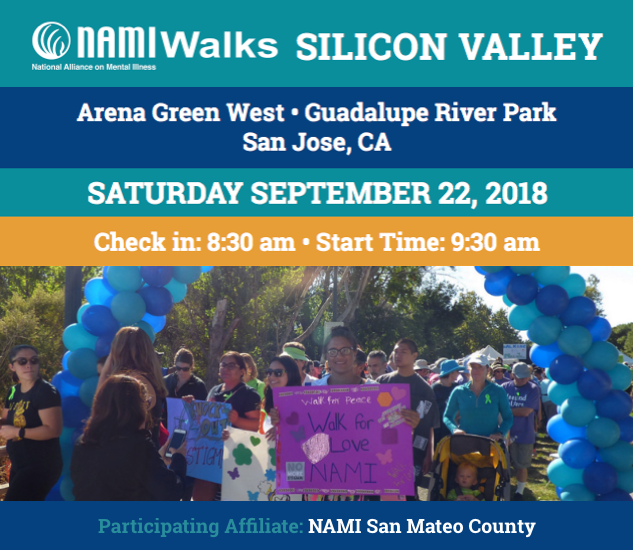 As a larger organization, Caminar adopted a new mission statement this spring, one that encompasses the breadth of services being offered in Santa Clara, San Mateo, Solano, San Francisco, and Butte counties: To empower and support individuals and families to move toward resilience, wellness, and independence. And we have a number of exciting initiatives that took root in fiscal year 2018 to bloom in this new year! 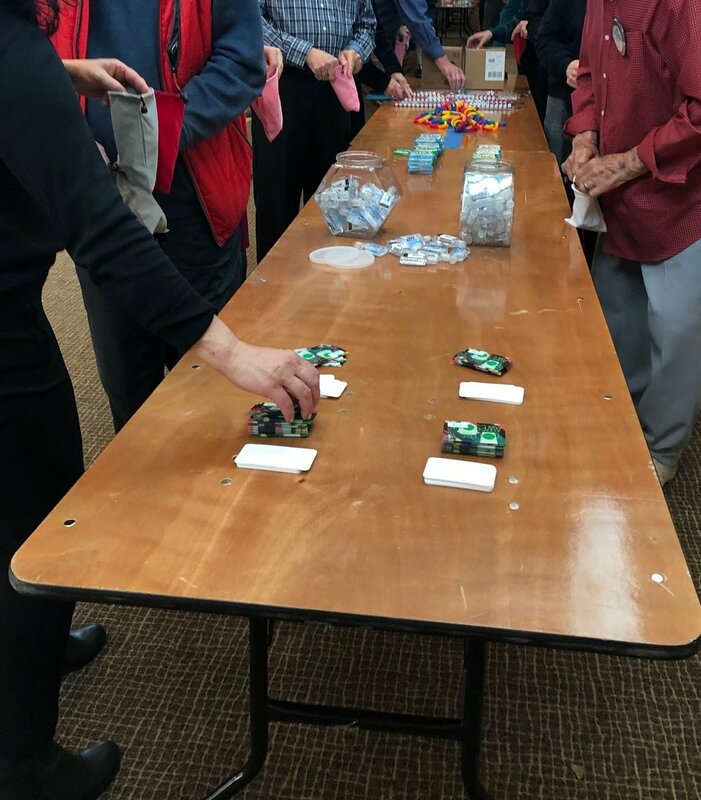 This spring, we were invited by Kaiser Permanente Northern California Community Benefit Programs to be part of a special mental health initiative. Through this grant, our LGBTQ Wellness and LGBTQ Youth Spaceprograms are among a select group of organizations in Northern California that now are working to reduce stigma around mental health topics. In addition, Kaiser Permanente renewed its support of our innovative trauma-informed schools initiative, Healing and Reduction of Trauma in Schools (HARTS), for the 2018-2019 school year. In August, the first full-time Medical Director in FCS history began work. In November, we will open the first peer respite home in Santa Clara County. This program will offer a safe and supportive voluntary option for adults living with mental health conditions who are experiencing or at-risk of a psychiatric crisis. 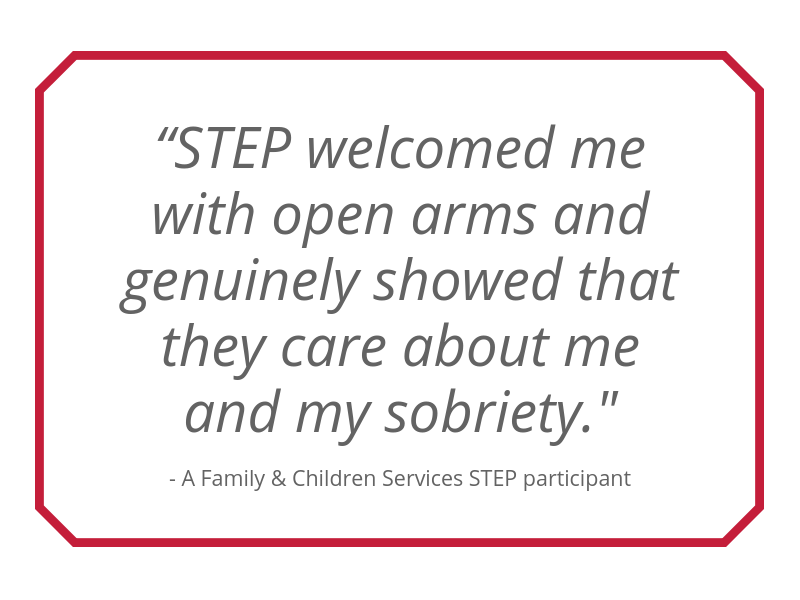 Across the country, this model of support has proven effective in offer a healing alternative to hospitalization. The program will be based on 3rd Street in San Jose, in a great house that Caminar acquired through this summer’s merger with Project Ninety. Thank you for all you do to advance our mission in the community. We value the partnership and support of our donors, partners, and supporters; honor the courage and resilience of our clients and their families; and celebrate the dedication, talent, and heart that our staff bring to their work.